Weddings are expensive, there is no way around it, even if you have the most budgeted friendly wedding you are still going to have to save up for it. I have been planning my wedding for 2 years and its now 4 months away and we are still trying to save every penny, however over the last 2 years, we have come up with a few tips on how to save money while still living our lives. One of these tips came about from us receiving an engagement gift from our friends. They got us a money jars that you have to smash to get the money out, it's a great idea as I am terrible for dipping into money boxes or saving that are easy to get to. The little tag on it said that if you save £2 coins it fits £1000 in it, which is crazy. 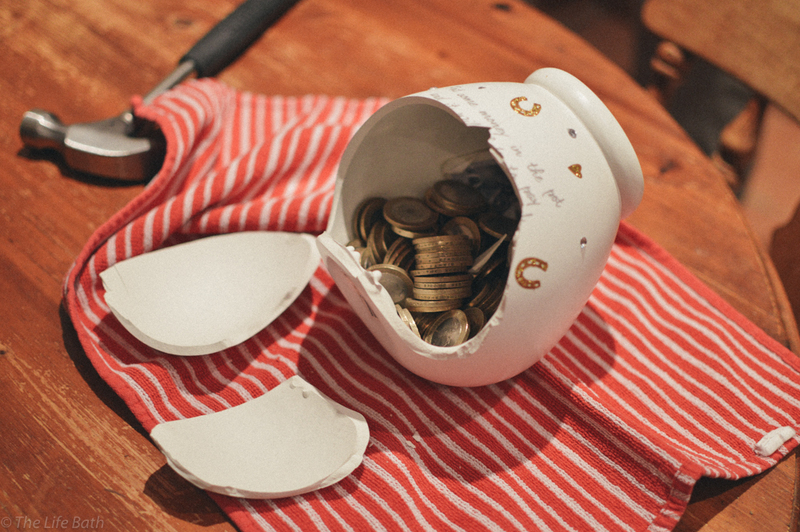 We set about saving our £2 coins straight away, but then came the biggest flaw in our plan, I am a bit like the Queen, I never carry cash with me and rarely taking money out of the bank but none the less we put the jar in our bedroom to remind us to start saving. After I put that fist few coins in I completely got the buzz for it, £2 coins add up quickly and it's surprising how many you do actually get in your change. I actually got really strict with it and even if I was down to my last £10 before payday and I got a £2 coin in some change I wouldn't spend it. Thom did the same even on a night out when he bought his first pint of the night and was given THREE £2 coins in his change (devastated). 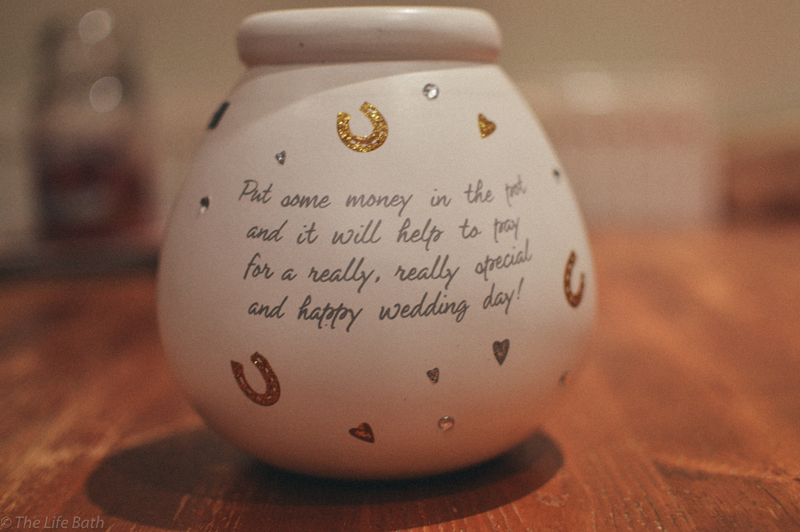 You have no idea how excited I used to get when I would drop a coin in and it stopped hitting the bottom of the jar and made more or thud noise rather than a ching lol, in my defence I was saving for a wedding I didn't get out much! I got some money for my birthday and Christmas as well so instead of putting it in the bank or spending it I put it in the jar. I was itching to open it but Thom wouldn't let me, but to be honest, it did make sense waiting until as close to the wedding as we could. The time eventually came the other day, 4 months before the wedding we opened the jar. 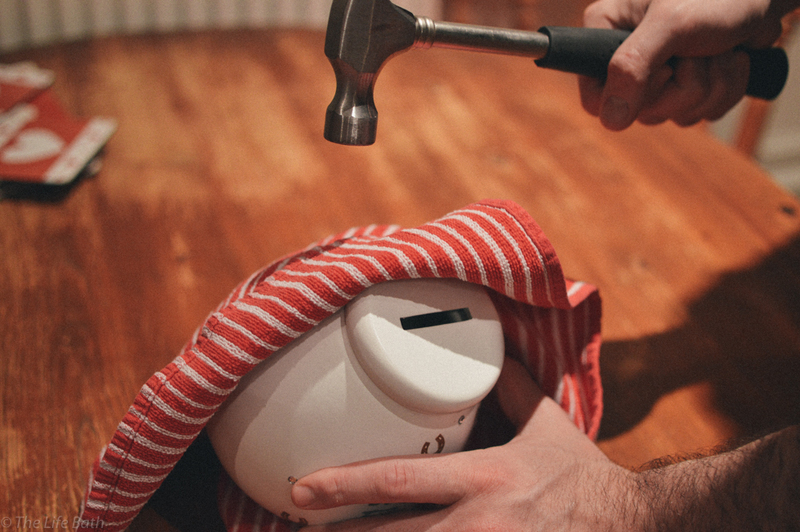 These types of money jars are great because they are fun to open, all you need is a hammer and a tea towel. I know it wasn't full but still a decent amount of money in it. We had a competition to see who could get closest to the amount that was in it, Thom went for the science approach by weighing the jar and then finding out how much £2 coins weigh, I laughed at him when he was miles off the actual amount. I went for the complete random guess approach and was a little closer. It was exciting smashing it open and starting to count everything. It felt like a real achievement actually. I hadn't factored this money into the wedding budget/savings so anything we had saved would be a bonus. Drum role please........ the final tally was £280. Not quite £1000 but a good effort none the less. 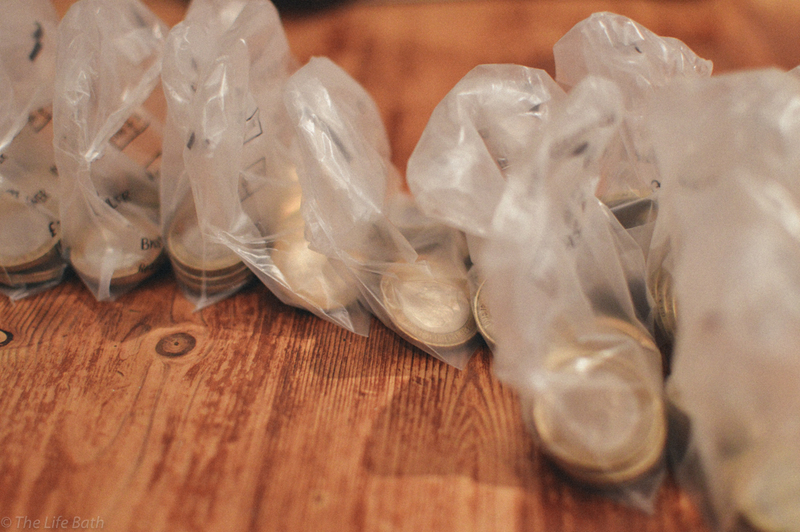 I actually really like saving £2 coins so I am going to pick up another money pot. 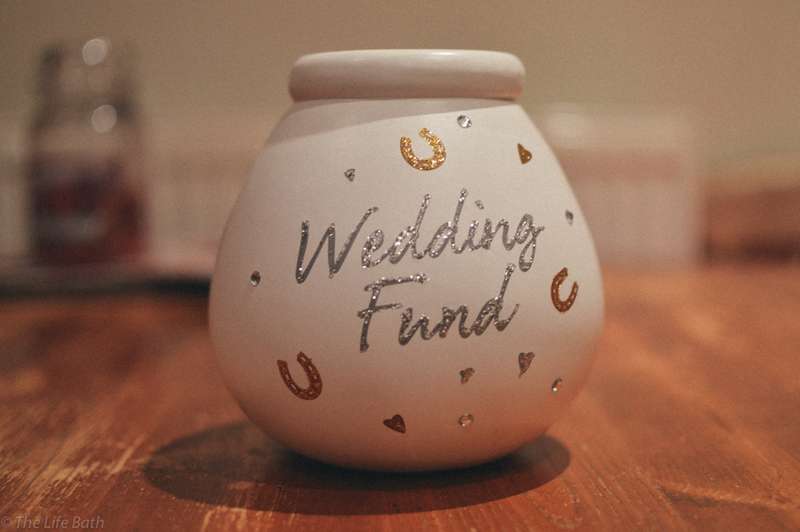 I am writing a few more tips on how me saved for the wedding but let me know in the comments below your top tips. Thanks for sharing these wedding saving tips. Few months ago, I had arranged my niece’s wedding at one of graceful wedding venues nyc which I came to know from internet. Glad to find this beautiful venue and had great time at wedding.